South Korean girl group, 2NE1 is slated to release their debut Japanese album entitled, 'Collection' on March 28, 2012. The album cover was shot by Hong Jang Hyun. 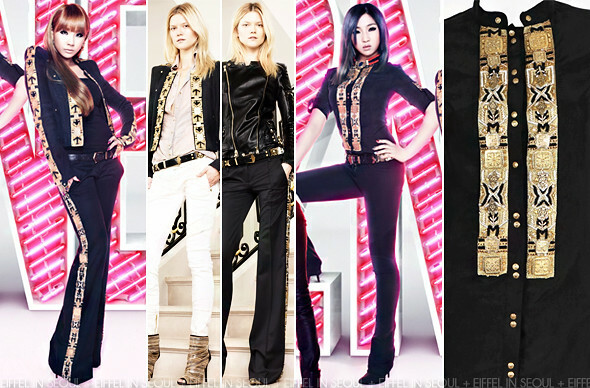 The ladies of 2NE1 were all seen wearing garments from Balmain Resort 2012 collection. Accessorizing their stylish looks with various Christian Louboutin heels. I would be lying if I said I wasn't disappointed looking at the photographs. The styling was so similar to their WWD Japan cover and editorial by Leslie Kee. I wished they drifted away from that and produced something much more spectacular and less predictable. My favorite among the four of them would be Sandara Park (박산다라)'s outfit. Although there was too much leather, I love the white blazer on her. The hairstyle worked for her too. Both Minzy (민지) and Park Bom (박봄) also sports choker necklaces from Mademoiselle Yulia's jewelry line, Giza's 2012 collection.